"'You can not reason with a tiger when your head is in its mouth.'" Winston Churchill (Gary Oldman) has the been the focus of a multitude of films, television shows and stage productions. His impact on history continues to fascinate audiences around the world. Between his oratory gifts and his willingness to take political risks have left his legacy as infamous as heroic. At one of the most pivotal times in human history, the leader of the island nation took a stand against the Nazi onslaught when virtually no other country was willing to stare Hitler down. 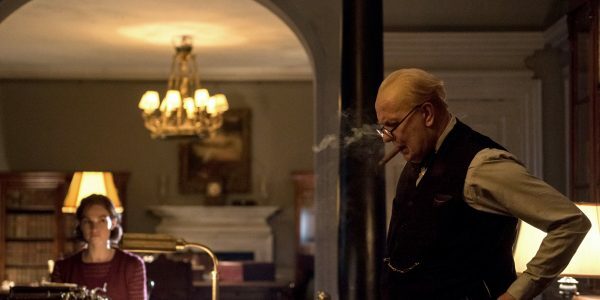 [caption id="attachment_101775" align="aligncenter" width="600"] Lily James stars as Elizabeth Layton and Gary Oldman as Winston Churchill in director Joe Wright's DARKEST HOUR, a Focus Features release.Credit: Jack English / Focus Features[/caption] Director Joe Wright (Atonement) brings the focus the first month of Churchill’s tenure as the British Prime Minister. Beginning with the early days of his need to work through the political minefield of determining his leadership in the shadow of the ousting of Neville Chamberlain (Ronald Pickup). With no time for to celebrate, the newest world leader is forced to decide between trying to find a peaceful resolution to Germany’s imminent invasion of all of Europe or face the Nazis alone in the European conflict. He must quickly learn who to trust within the government, the military, his family and the monarchy. It has been a year of Winston Churchill influenced films with Brian Cox’s thoughtful and methodical take on the British leader in Churchill to the power of his oratory skills delivered in conclusion to Dunkirk. Proving that this flawed, but fascinating man’s influence continues to ripple throughout history. 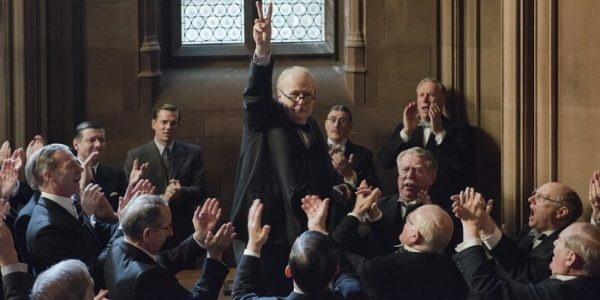 Darkest Hour has been a passion project for writer Anthony McCarten (The Theory of Everything), and it shows in focus and drive in the script. His characterization of Winston Churchill partnered with the acting abilities of Oldman were concentrated and masterful. This dominant figure in history is shown to be brilliant, yet exceptionally flawed in his people skills and realized that most people were merely players in his game. It was a fine line between showing how he balanced his immense ego with the full awareness of his apparent weaknesses. Joe Wright can portray the leader as calculating, but someone who was not afraid of taking exceptional risks with relationships and peoples lives. Each frame of the film focusses on Churchill and the impact of his decisions and how pivotal he was in the formation of the history of the modern world. 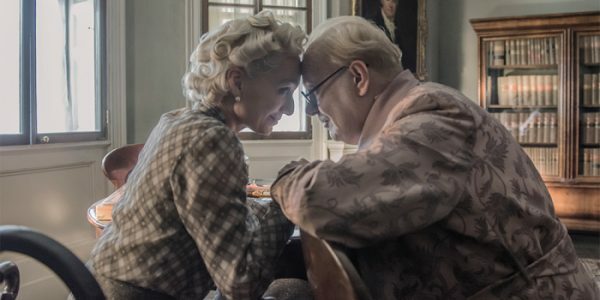 [caption id="attachment_101774" align="aligncenter" width="600"] Kristin Scott Thomas and Gary Oldman star as Clementine and Winston Churchill in director Joe Wright's DARKEST HOUR, a Focus Features release. Credit: Jack English / Focus Features[/caption] The singular focus of the film does labor under the weight of this character and the situations that he was forced to confront. Oldman can carry the burden, but the majority of the other characters become meniscal in their influence on the story. Ben Mendelsohn, Kristin Scott Thomas, and Lily James were terrific when they were on screen, but they were small stars orbiting the sun as the support for the central character. Wright did not waste their talents or any moment on screen but seemed to live under the realization that this film centers on Winston Churchill. Darkest Hour is a familiar, but fascinating depiction of a linchpin portion of history. To focus on this dynamic leader is understandable, worth the price of admission and should garner a multitude of award nods in the coming season.